As one of the top cosmetic dentists in New York City, Dr. Michael Kosdon has a long-established reputation for creating beautiful smiles with aesthetic dentistry. His expertise, artistry, and personalized treatment approach attracts patients from across the nation and throughout the world. The high-quality, natural-looking custom porcelain veneers, crowns, and dental implant restorations he designs have transformed thousands of smiles. Patients who prioritize superior results and patient care, as well as those who desire life-changing smile makeovers, continue to choose Dr. Kosdon for treatment. We see many patients who travel to New York City to meet with Dr. Kosdon, and as a result, our office offers options that make it possible to begin pursuing your new smile from home. Our team can even help you arrange accommodations that meet your requirements to make planning your trip simple. New York City is one of the top travel destinations in the world, and home to Dr. Kosdon’s East Coast cosmetic dentistry office. 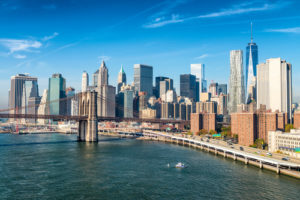 Located in Manhattan, our practice is surrounded by incredible sightseeing opportunities, museums, shopping destinations, restaurants, and luxurious hotels that can turn your trip for dental treatment into an enjoyable vacation in the Big Apple! Not sure where to start? Let our friendly office team provide you with helpful travel suggestions and local recommendations you won’t want to miss. Begin the smile makeover process from the convenience of home with a virtual consultation! Instead of traveling all the way to our office to discuss your smile concerns, dental issues, and desired goals, connect with Dr. Kosdon through a video conferencing portal to start exploring your potential treatment options. After learning about your personality, lifestyle, and aspirations, Dr. Kosdon can describe customized touches designed to make your treatment and results as personalized as possible. Unfortunately, there are limitations to what a virtual consultation can accomplish; however, this opportunity can be a big step toward achieving the healthy, beautiful smile you desire. Filling out our digital smile quiz requires only a few moments of your time! Share some basic information with us about your dental health, current appearance of your teeth, and what you want to change about your smile. The smile quiz is a great way to start a discussion with Dr. Kosdon and our team regarding the best way to create your dream smile. Take the Smile Quiz now. If you want to start planning your smile makeover and trip to New York City, we encourage you to contact our office to start discussing your needs and goals.